These are a few of my favorite things. I like reading the favorite things lists of others. It's fun to find something that you didn't know was out there. So, I thought I'd share some of my favorites. 1. 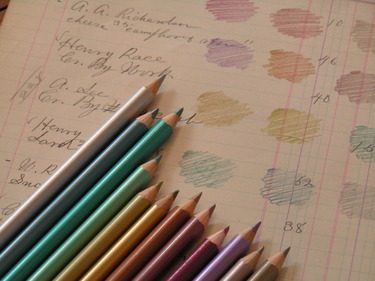 These Metallic Art Pencils from Stampin' Up. They glide on so smoothly and have a subtle shimmery effect, not overdone. And they're just barely triangular so they won't roll off your desk! Gorgeous color palette too. Not-too-bold colors that are perfect for a subdued vintage look. 2. Comptoir Sud Pacifique fragrances. I can't seem to wear department store perfumes without getting a terrible headache. Sometimes I can't even walk into a department store's fragrance dept. without getting a headache actually! I discovered Comptoir while working at Barneys and have been a fan ever since. 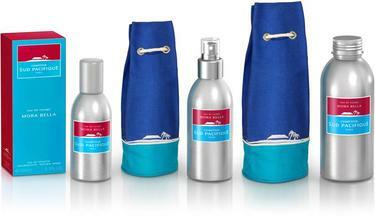 They are especially good summertime fragrances. Mora Bella is my favorite. (For you Comptoir deveotees, it used to be called Fruits Sauvage.) Ebay is a great place to buy it for a little less. 3. 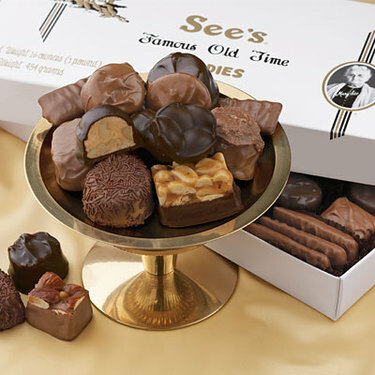 See's Candies. Yum is all I can say. Just look at that picture. No further description needed! I'm sure most of you California girls know these candies well since the company is based there. But, out here, you just can't find them as easily. I ordered a box of assorted chocolates on-line last month. They were gone pretty quickly. I miss them. A lot. 4. These little candies from Wilton. Is this a problem that Ive listed candy twice in a row here? I think I have issues. Anyway, love these butter mints. There's a jar of them sitting on my desk right now. mmm-mmmmm! Got them at Michael's in the bridal section. I find myself shopping the bridal section all the time. No, I'm not planning another wedding. I just love wedding stuff. Sometimes I even buy Martha Stewart Weddings magazine for all of the beautiful ideas & inspiration. 6. 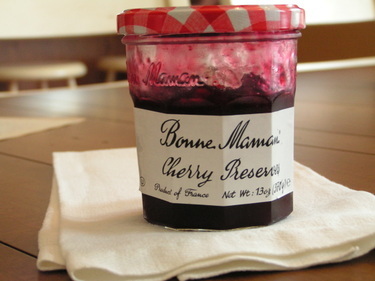 Bonne Maman Cherry Preserves. I think I'll go make some toast right now actually. Yummy. I'd love to read some of your favorites lists. If you post one on your blog, leave a comment here so I can check it out. If you don't have a blog, list a favorite item in the comments section. Isn't this fun? Now we can all find new things to love! Now, off to make toast! P.S. Thanks you guys, for all the love for my current shop projects. It made all the hard work worth it. Thank you. Thought I'd share a few pictures of some of the things I've been working on for the shop. 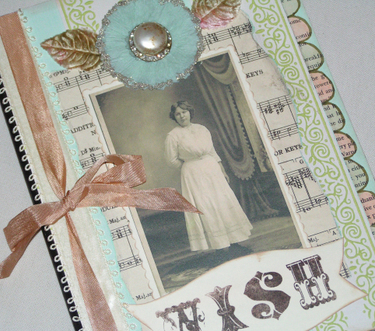 This WISH journal is one of several journals in the making. I love the woman on this cabinet card. She looks like a fairy godmother sort, don't you think? The type that could grant wishes. 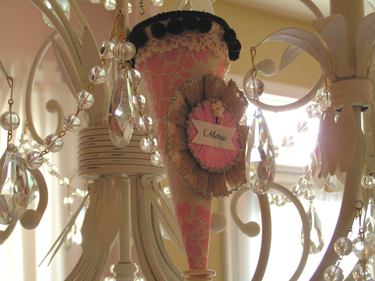 A Trinket Cone dangling from my kitchen chandelier. Lots of cones hanging around here lately. There will be quite a little variety for sale. Some Paper Cakes in waiting. Still need their finishing touches. These are just a a sampling of things I've been creating. There are many other items for sale that fall into the "Fancy Notions" category. They include some favorite products that I use in my art....such as ribbon by the yard, glass glitter, the yummiest glue stick ever and lots of embellishments imported from Germany. 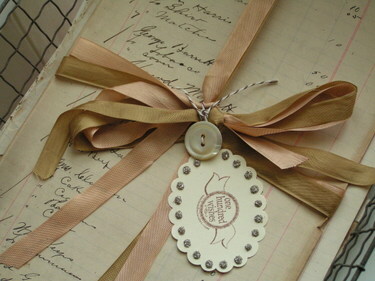 Some very special "Trinkets & Treasures" are in store too. I'll save them for another post. Weekends just go by far too quickly. We spent our Sunday morning in the canoe. We only saw 2 other little boats the whole time we were on the reservoir. It was exactly the kind of tranquility we were seeking. 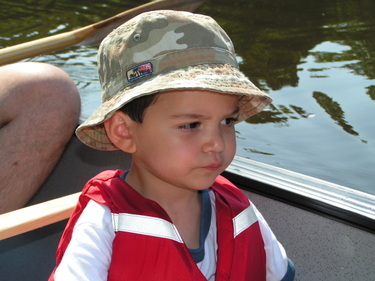 Even Mario just sat at the bottom of the canoe and looked into the gentle water. If it wasn't for the intense sun, we could've stayed out all day. Beautiful and peaceful. And now, it's back to the daily grind! Mario took a 3 hour nap, and I got so much done today. It feels good to create. I have this need to create. I am happier when I do and "If mama ain't happy, ain't nobody happy". It's the truth, isn't it?! I've been snapping photos for the shop. I'll post some peeks tomorrow or Wednesday. Happy Monday everyone! 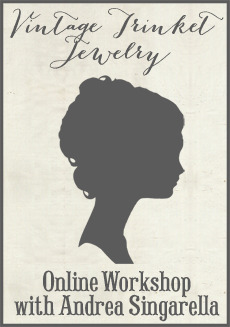 The time is drawing near and I still have lots to accomplish before my shop opens. I know I had originally said it would be open for business near the end of June or beginning of July. However, it's looking more like the end of July. If it happens sooner, that's a bonus. It will happen in July though! It's just that I keep creating more items and can't seem to stop thinking of interesting things to sell. I just added a little newsletter sign-up button in the right hand margin of this blog. 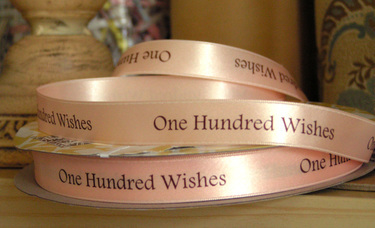 If you'd like to sign up for the One Hundred Wishes newsletter, simply fill in your email address and click "join now". That way, you won't miss any shop news or updates! edited: If you tried to sign up on Thursday when I originally posted this, please try again. It wasn't working properly then, but is fine now. Thanks for your patience! Thank you guys so much for all of your words of encouragement and support. It means the world to me. You have no idea how reaffirming it is to know you're all out there! My crafty soul-sisters you are. Thank you a hundred times. Wishing you all a happy and safe Independence Day! 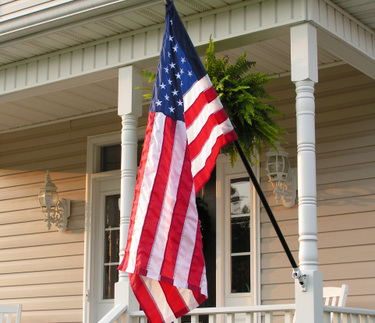 May your day be filled with barbeques, fireworks and a prayer to keep our brave troops safe until they all come home. Clearly, I shouldn't be eating this for breakfast. Right? Well, I just can't help myself. Usually I'm a very good girl and simply have a bowl of yogurt and fresh fruit. Hey, at least I'm drinking decaf. My baby might go into sugar shock, but not caffeine overload! 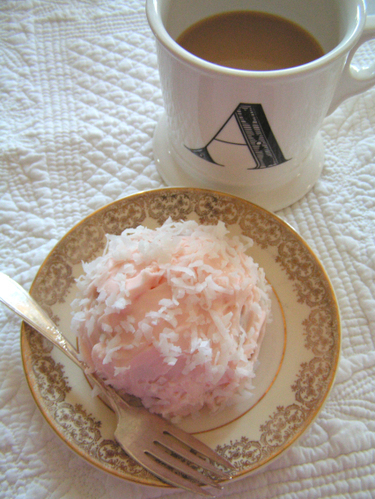 So, I made these pink coconut fluff balls yesterday. They are yummy, but quite sweet. 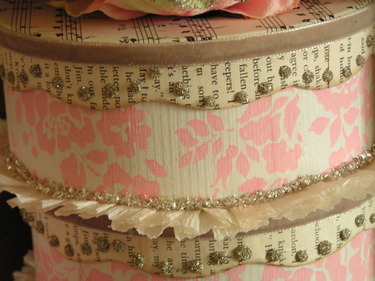 Would be perfect for a little girl's birthday party. Scroll all the way down for the recipe. It came in a little promo packet from Hallmark magazine. They're looking for subscribers. Well, unfortunately, my coffee table's legs are gonna break if I put one more magazine on there. But.....I do have room for one more book! I finally got my hands on it. Yippee! So, the pink fluff balls are an appropriate breakfast while I read through this book, don't you agree? 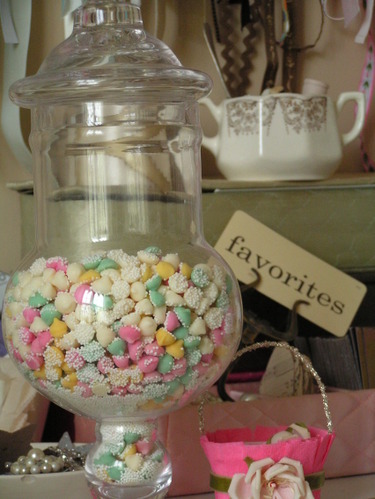 Candy-colored and fun and vintage-inspired and heart-warming and special and unique. 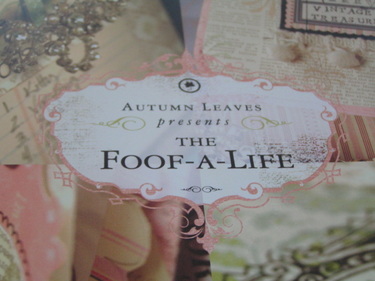 That's how I describe Foof-A-Life. Love it. All of the contributing artsits did a gorgeous job creating art for this book. Congratulations to Teresa for what must have been a dream come true! 1 cup buttermilk at room temp. 1. Preheat oven to 350 degrees. Grease 10 of the cups in two extra large muffin tins. 2. Beat the butter and sugar with an electric mixer for 5 minutes at medium speed until light & flufffy. Beat in eggs, one at a time. Scrape the bowl & beaters and beat well to incorporate. 3. Sift the flour with the baking powder and baking soda. Add a quarter of the flour mixture to the butter-egg mixture, then add the vanilla and a third of the buttermilk. Repeat, beginning and ending with the flour mixture and scraping well after each addition. 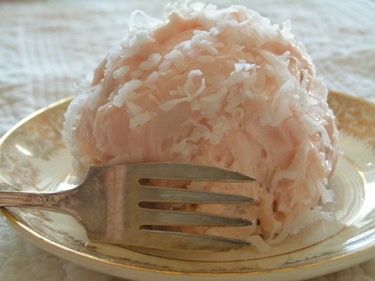 Fold in flaked coconut. 4. Fill the muffin cups 3/4 full and bake at 350 for 18-20 minutes, or until a toothpick inserted in center comes out clean. Cool in tins on racks for 5 minutes. Then, turn out onto racks to cool completely. 6. Once the cupcakes are cool, freeze them on a parchment or wax-paper-lined tray for 20 minutes. This will make them easier to frost. When you're ready to frost, spread a thick even layer of frosting all over the cupcakes. Sprinkle generously with coconut.Then, freeze them again for 30 minutes. 7. I stored mine in the refrigerator. Enjoy!